THE TINDER BOX was registered with the Bureau of Domestic Trade on September 13, 1982 for the purpose of marketing Philippine-made cigars, cigarettes and liquor. It was awarded the franchise for such concession at the Ninoy Aquino International Airport shortly thereafter within that same year. It has been in operation there since then until the present. In 1993, THE TINDER BOX decided to expand its operations. It was awarded the exclusive distributorship of Tabacalera and Alhambra cigars for the entire Visayas. Thus, it opened its first Cebu retail branch in December of 1993 at the Isabelo Arcade in General Maxilom Avenue . It also established an outlet at Shangri-la’s Mactan Island Resort in early 1994. Due to the increased volume of business after it was also awarded the exclusive distributorship of Remy Philippines products for the Visayas, the store had to move to a bigger and better site at Astron Gestrus Bldg. in Gorordo Avenue . In March 1996, it was awarded the franchise for a cigar and liquor shop at the Mactan International Airport (Domestic Area). The succeeding years witnessed the full-blast expansion of The Tinder Box. The main Gorordo store broadened its scope to include a wine cellar, cigar lounge and espresso bar. A similar satellite was opened at the Supercat Terminal at Cebu ’s waterfront. In July 1999, the Tinder Box decided to move to a new and bigger location at the Check-In lounge of the MCIA’s Domestic Area in order to incorporate a cigar lounge and espresso bar into its store. The exact same concept was established in the International Area at the same time. The Manila operations likewise expanded its marketing thrust. In December 1999, the Tinder Box was awarded the permit to operate the smoking lounges at both international and Domestic Wings of the New NAIA Centennial Terminal 2. Aside from still selling cigars, wine and liquor, the full-service outlets serve espresso coffee concoctions and gourmet sandwiches, deli meats and cheeses. Since THE TINDER BOX has also expanded to volume sales to hotels, resorts, restaurants and other tourist-related establishments, it formed its sister company, ZARA MARKETING CORPORATION, to handle its wholesale market. It was made the exclusive distributor of Brown Forman Worlwide L.L.C., Jardine Wines and Spirits, Inc., Werdenberg International Corporation products for Cebu and the rest of the Visayas. The turn of the millennium in 2000 saw the biggest and most ambitious project of The Tinder Box – the construction and subsequent operation of the 4 – in 1 signature store at Archbishop Reyes (Banilad) Avenue. It combined a Smoking Lounge, Wine Cellar, Café and Delicatessen under one roof. 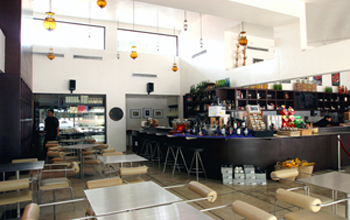 With its renovation and expansion in late 2003, The Tinder Box has extended its deli area and added a Houseware section for the shopping convenience and customer satisfaction of its patrons. Recognized as one of the best restaurants in Cebu City, The Tinder Box elevates dining to heights of new perfection. With the opening of its Restaurant Aziza, The Tinder Box redefines the Cebuano taste. A variety of French-mediterranean dishes awaits those who wish to satisfy their discriminate culinary cravings with elegance and style. Our wholehearted mission is to consistently render personalized service to provide the finest products to a discriminating market through a dynamic team of professionals driven by our world-class culture of excellence. Guided by this mission, we see ourselves as a key player in the food service industry, as specialist in customer service, as innovator in product development and distribution, and as partner of our clients in creating the market demand, thereby maintaining our leadership in the marketing field.